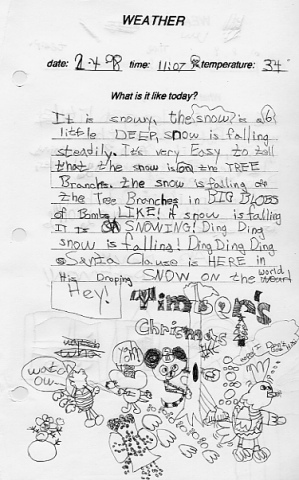 This photograph shows a couple of Holly's weather pages from 1998. She always drew a cute picture on the weather pages. She didn't work on the weather page everyday, she did this a few times a year. The point of the weather assignment is probably obvious - She will make observations and record them. Her drawings are not factual - there are no ponies, chickens, and tigers living together in our backyard, but her data are factual - the time, the temperature, and the date. 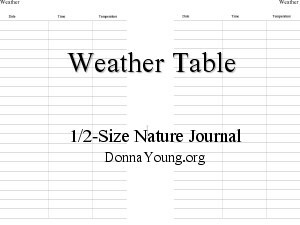 My son entered his weather data in a different type of form- it was a table into which he recorded certain data on a daily basis. The printable files are designed to print on a full sized sheet of printer paper. After printing the file on both sides of one sheet of paper, fold the paper in half and cut it along the fold line. Hole punch along the cut edge to fit your binder. 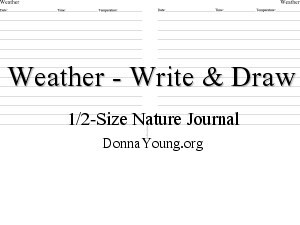 This weather journal page is similar to the one pictured above, but at the same time it is not the same. 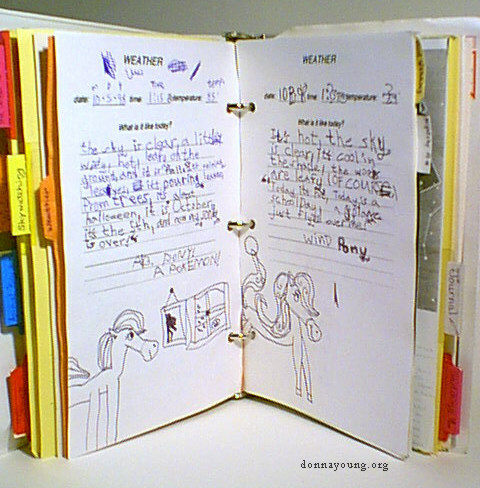 The next file is a table into which your child should record the date, the time, and the temperature.